I've also ordered a latch hook rug kit of the exact same dragon, by the same company. I've never done latch hook before, this will be an adventure. I finished this as a wall hanging for our daughter and Mike. 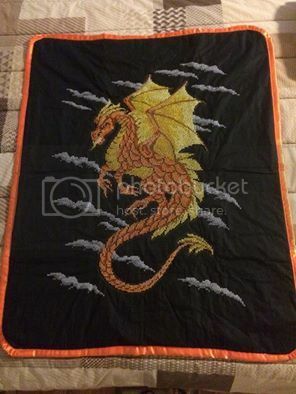 Then I sent it to Aranel and she outlined the whole dragon in metallic thread, added a border and quilted it, making what was a nice piece into something truly spectacular. Thanks to her, it's now an heirloom! Michelle's post makes us realise no one has posted any craft works for some time. So what gives? Priscilla, are you crafting these days? I'd say send Priscilla a personal mesage, Michelle. That way she'll get an email that there's a message. Don't know how often she's in here. She might have the pattern still. Sorry folks. Yes, I am certainly crafting but I take all my pictures now with my cell phone and I have no idea how or if it's possible to get them onto a website. I don't know if I still have that pattern, I'll have a look. Edit: no luck unfortunately. I do still have the original blue dragon picture and I suppose it might be "possible" to recreate the pattern on graph paper but I think that would take quite a lot of time. Last edited by Priscilla; Feb 18 2016 at 04:47 PM. Oh well - I did rather figure as much. Started trying to recreate the pattern last night just in case (in Excell bc I didn't have any graph paper lying about). So far it's doable if really mind-numbing. I've completed an entire foot and started a leg. If I a) manage to successfully reproduce it and b) manage to successfully complete it I'll post the results lol! Really sorry and good luck to you!! Wait, wait! I just googled Paladin dragon cross stitch pattern and it came up! Try googling and I will grab the name of the company that had it for sale! I found them both by first googling Paladin dragon cross stitch pattern. I hope this helps. Actually, I may have my husband order me another copy! I tried to find it yesterday - but I was mostly searching w herschners (or however you spell it!). Didn't even think to see if other companies had it! ETA: This is the actual designer's website and their list of suggested retailers. Plan to buy from one of them in case they pay royalties etc to the creator. Mostly just stubborn and persistent, but thanks! I'm glad I found it! Hmmm. how long shall we give you before pics are demanded, Michelle? It's a lovely design, good luck. Honestly not sure - it might take a month for the website to even deliver it to me but I want to make sure I'm supporting the artist and I'm not in any major hurry. I'm kind of hoping to have it done by my birthday in July but I'm honestly not sure how much work is involved or how long it will take. My last attempt at getting into cross stitch was a very long time ago. Michelle!!!!! I see you are in Wellington NZ. Are you involved with The Tattoo ???? IF you're helping old ladies there you won't have time for stitching aye???? Nope, not involved. Would have loved to have gone but tickets are so expensive. So sadly no helping of old ladies But hey, more time for craft, right? There are now four fans in the Wellington area! We could've done with somebody with (a) common courtesy and (b) some idea of how to get off that high walkway without going down steps after the tattoo on Thursday night. When we asked for directions from the ticket collector at the blocked gate we were directed in the opposite direction from the one we wanted to go in and finished up having to cross a railway line, a motorway, and walk right round the closed railway station to the bus station - there being no taxis. By then the last bus had long gone and there were still no taxis. And no way could I have afforded it either. It was a birthday present from my son and daughter-in-law. You've inspired me, Michelle. My husband is ordering me another copy of the pattern. It will have to sandwich itself in between my usual Christmas ornaments and a couple small table cloths I'm doing as wedding gifts for son and his fiance! (wedding next year) They love cats so naturally both are cat-themed! Were you at the Tatoo on Thursday, Vyon???? So was I ! And wandering around looking for a ride down to the parking area. Took us an hour to get out of the stadium. I won't lie - that's kinda weird. Not sure I've ever come across three other kiwi fans on one website before. Let alone ones from my actual city. @Vyon - that sounds horrid! I mean, on the one hand I'm not entirely surprised because good heavens stadium staff can be disorganised (I can say that - I used to work there lol!) but still - someone should have been thinking ahead. That walkway is horrid. It's almost a kilometer long and then at the end you've got to find a bus/carpark/taxi etc. My dad had to walk it once with a broken foot - hobbling on crutches the entire way. It needs to be more accessible. Lucky you were all able to get home okay! Michelle - there was quite a stink about the lack of mobility accessibility . I believe the next night was a lot better. So they did want to oblige. @Lily - yeah, just feels like something they should have anticipated. But it is good they took steps to improve things over the next few nights. Anyway! Just got an email that they're shipping my pattern to me! Should be here in a week or so! My husband has ordered my copy of the pattern, Michelle. I am thinking about making my first one a "rainbow" dragon, just for the heck of it! If this posts ok, you'll see why Lily took an hour to get out of the stadium. And that the average age of the crowd is NOT 75, as claimed by the organisers. They were just plain disorganised. As was the bus company. They advertised that there were late busses, and to look up the route number. Which said there wasn't a late bus. Must've been the Night Rider from Harry Potter then, because I saw it on two subsequent nights disgorging half a busload of passengers at the stop at the bottom of Brooklyn Road, which is visible from my bedroom window. Two more of the photos that I took on the night. The show was absolutely fantastic, fast-moving, most of my photos turned out blurry. My Paladin dragon pattern has arrived. The first thing I'm doing is having my husband make several copies so if I want to mark them up with color choices it will be easier. It may well be months before I get around to doing anything, my sewing calendar is pretty full. Oh yes it sure was!!!!! And we were lucky and caught a trolley at the beginning of its run. We could have been another hour if we had waited. And today I went walkabout behind the railway station - and discovered that the raised concourse that we were misdirected off in the wrong direction ends in a huge covered spiral pedestrian ramp right behind the bus depot. So we spent half an hour walking in the opposite direction from the bus depot and back again for nothing.